The International Association of Lions Clubs was organized in 1917 with 22 clubs in nine states and is grown to 45,923 clubs with 1.4 million members and 193 countries. The International Association of Lions Clubs, through its fundraiser called "Campaign SiteFirst II", is trying to prevent or even cure 40 million cases of blindness worldwide. Lions from all around the world have raised over $148,600,000 for this program. We provide thousands with free, quality eye care, Braille-writers and large print texts, white canes and guide dogs. 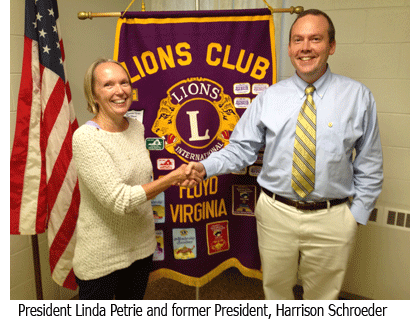 In addition, the Lions Club provides free professional glaucoma screening and make cornea transplants possible. The Lions major work in the area of sight conservation although other projects such as drug awareness programs in schools, diabetes awareness and other programs specific to individual clubs. Lions have taken up the mission of sight conservation as their major goal after a speech cancel that Helen Keller. At the Lions convention in 1925, Helen Keller change the Lions to be, "Knights of the Blind". Today Lions collect more than 5 million pairs of glasses annually. The Floyd County Lions Club continues this commitment by collecting eyeglasses and hearing aids at locations in Floyd County. The club also provides free eye exams and glasses for needy children.